In Dr Roger Levesque’s laboratory, we work mainly with P. aeruginosa which can cause serious opportunistic infections, most notably in the cystic fibrosis (CF). Well known for its natural antibiotic resistance and incredible capacity of adaptation P. aeruginosa is the main cause of chronic lung infections and consequently morbidity and mortality associated with CF patients. Using multidisciplinary approaches we are trying to address the problematics of those infections and find an alternative treatments. Developing of new antibacterial inhibitors implies using a combination of in vitro bioassays alongside experimental animal lung infection models. For ethical and technical reasons we decided to develop a pluricellular ex vivo lung tissue model. To achieve this objective we will use the CELLINK BioX technology to create a 3D model of the human lung. This model will be used to study the pathogenesis mechanisms of all known lung infectious bacterial strains and to test the potency and cytotoxicity of potential therapeutic compounds. The lung constructs can also serve as powerful models for high-throughput assays commonly used in the fields of genomics, transcriptomics and proteomics. In turn, this will lead to the massive acquisition of significant biological data. Our interest for the applied technologies combined with the care for reducing animal use in research turned us to the emerging 3D bioprinting technology. This promising new technology allows accurate dispensing of the desired human cells in the appropriate bioink ultimately mimicking the in vivo environment. Therefore, bioprinted tissues offer improved ex vivo/in vitro models that could now be used for high-throughput assays in genomics, transcriptomics and proteomics, and leading to massive data acquisition of greater biological significance. In several cases data acquired through animal testing have shown to be non-transferable to humans due to genotypic and phenotypic differences, particularly from rodents. In addition, classical cell and tissue culture lacks the complexity and tissue-like structure relevant to detailed biological analysis, not necessarily predictive in treatment and providing poor clinical outcomes. 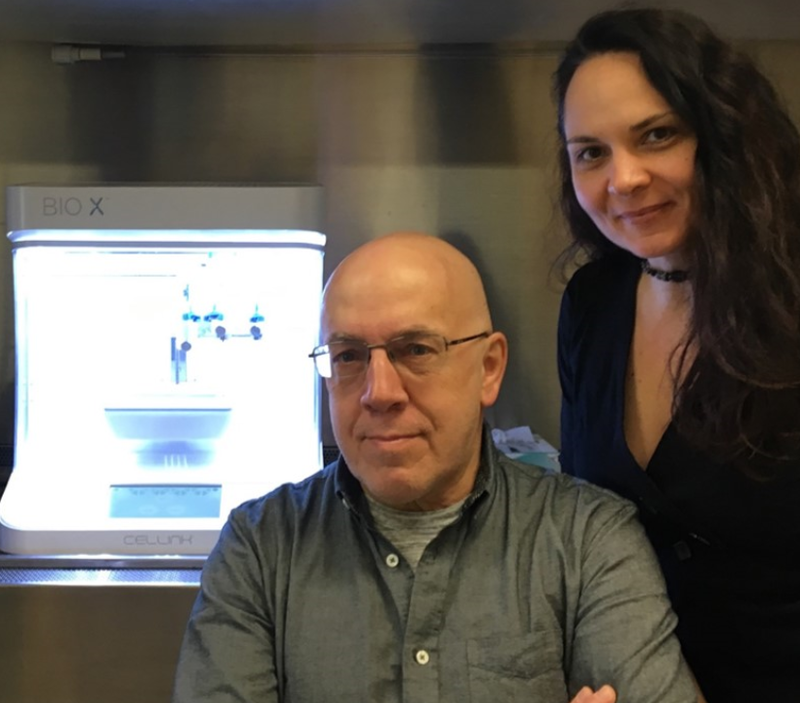 In our studies, 3D bioprinting of human lung tissues will be performed using CELLINK’s third-generation printer, the Bio X. The alveolar tissue region of the lung will be printed using appropriate human lung cell lines and primary cells for the formation of the stroma and epithelium. By focusing on global gene expression using the human lung transcriptome, transcriptomic profiling of individual and assembled cell lines will be performed to demonstrate the relevance of such an engineered tissue. Moreover, uninfected and infected lung constructs with typical bacterial strains causing lung diseases will be treated with Tobramycin, mimicking CF therapy, as well as non-toxic novel inhibitors. To establish the printed lung tissue response to molecules alone, infection and treatment, the classical histological, immune and tissue viability assays will be combined with a global genomics-based RNA-Seq of printed tissues. AmpliSeq measures the expression levels of over 20,000 genes covering 95% of human transcripts giving an intimate knowledge of expressed genes. The repertoire of differentially expressed genes will be compared to normal and CF tissues in the lung Expression Atlas. Furthermore, data mining for levels of expression, SNPs, gene organization and rearrangements will be pursued. Ultimately, 3D bioprinting lung tissues using human airway cell lines and primary cells will lead to functional near-native microanatomy providing powerful means for ex vivo modeling of tissue morphogenesis and organogenesis. 3D bioprinting has emerged as a promising new technology and literally exploded in the last few years. The number of possibilities is unlimited and using this technology we can change the way how modern infectious diareses and medicine function. We can create new models of tissue and organ structures for any type of medical research. This field is more than exciting and brings the research to the next level. I’m so proud to be part of this community and I hope profoundly that we will contribute to improve the patient’s welfare and reduce the animal testing in the same time. It is amazing!